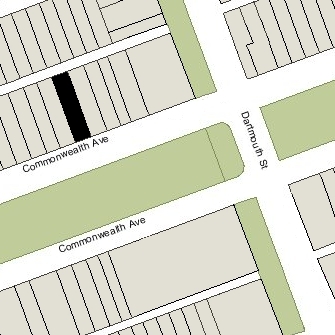 169 Commonwealth is located on the north side of Commonwealth, between Dartmouth and Exeter, with 167 Commonwealth to the east and 171 Commonwealth to the west. 169 Commonwealth was designed by Peabody and Stearns, architects, and built in 1879-1880 by Vinal & Dodge, masons, and Norton and Chedley, carpenters. It was built as the home of Joseph Story Fay, Jr., and his wife, Rebecca Rodman (Motley) Fay. They previously had lived at 88 Mt. Vernon with his parents, Joseph and Sarah (Bryant) Fay, and probably before that, during the 1879-1880 winter season, at 251 Beacon. Joseph Fay is shown as the owner of 169 Commonwealth on the original building permit application, dated October 23, 1879. Joseph Fay was president of the Champion Iron Company and treasurer of the Lake Superior Iron Company, and was a noted yachtsman. He acquired the land for 169 Commonwealth on November 21, 1878, from Charles L. Andrews. Charles Andrews had acquired the land on May 20, 1873, from John C. Ropes, who had purchased it on the same day from the Commonwealth of Massachusetts. Click here for an index to the deeds for 169 Commonwealth. The Fays continued to live at 169 Commonwealth during the 1892-1893 winter season, but were living elsewhere for the next two seasons. During the 1893-1894 winter season, it was the home of William Henry Howard and his wife, Anna Dwight (Whiting) Howard. William Howard was a land owner and cattle rancher in California; the Howards probably were living in Boston temporarily when their eldest son, William Davis Merry Howard, entered Harvard. During the 1894-1895 winter season, 169 Commonwealth was the home of Miss Adele Granger Thayer. By the 1895-1896 season, she had moved to 181 Commonwealth. Joseph and Rebecca Fay were living at 169 Commonwealth during the 1895-1896 winter season, but were once again living elsewhere during the next two seasons. During the 1896-1897 winter season, 169 Commonwealth was the home of dry goods merchant Francis Wright Fabyan and his wife, Edith (Westcott) Fabyan. 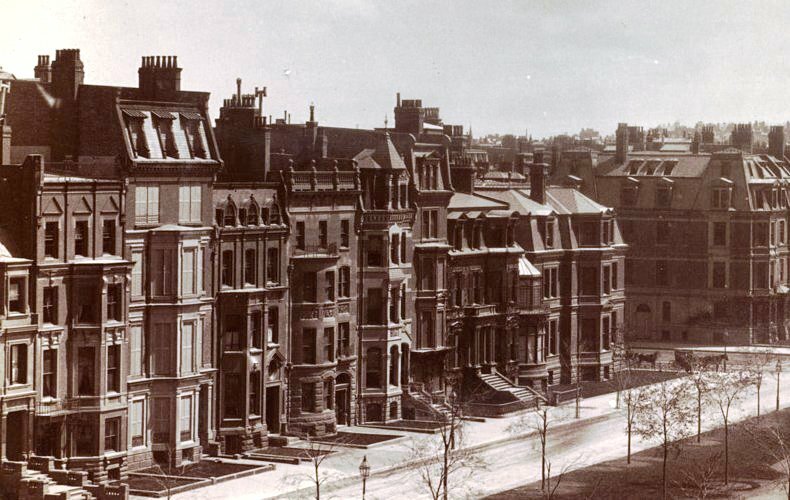 They had lived at 148 Commonwealth during the previous season, and by the 1897-1898 season had moved to 1 Charlesgate East. During the 1897-1898 winter season, 169 Commonwealth, 169 Commonwealth was the home of stockbroker William Bowditch Rogers and his wife Augusta (Kellogg) Bowditch. They had married in July of 1896 after which they had traveled abroad for about eight months; their eldest son, William, Jr., was born in May of 1898 at 169 Commonwealth. By the 1898-1899 season, the Rogerses had moved to 151 Commonwealth, and 169 Commonwealth was once again the home of Joseph and Rebecca Fay. In mid-1901, Joseph Fay acquired 184-186-188 Commonwealth, The Abbotsford apartments, across the street. Rebecca Fay died in June of 1905. Joseph Fay continued to live at 169 Commonwealth, and in May of 1907, he married again, to Mabel Grace (Ely) Koenig, the widow of Fidèle Koenig, a composer and noted opera vocal coach in Paris. Their son, Fidèle Koenig, Jr., lived with the Fays. Joseph Fay died in February of 1912. Grace Fay continued to live at 169 Commonwealth. She also maintained a home, Edgewood, in Woods Hole. Fidèle Koenig and Joanna (Joan) Lillie Fay, her daughter by her marriage to Joseph Fay, lived with her. Fidele Koenig married in September of 1921 to Mary Elizabeth Hodges and they lived with his mother at 169 Commonwealth until about 1924, when they separated and he traveled abroad. Joan Fay married in February of 1928 to Clarence Edward Shankle, a military flying instructor. By 1930, they were living at the Maryland Apartments at 512 Beacon, and moved soon thereafter to Arizona. Joan (Fay) Shankle was the first woman to receive a pilot’s license in Massachusetts. In October of 1929, she completed a solo transcontinental flight. Grace Fay continued to own 169 Commonwealth; however, the house was indicated as “closed for the winter” in the 1924-1928 Blue Books, and she lived at the Hotel Vendôme. On January 10, 1928, 169 Commonwealth was purchased from Joseph Fay’s estate by banker and broker Isaac Tucker Burr, Jr., and his wife Alice McClure (Peters) Burr. They previously had lived at the Hotel Agassiz at 191 Commonwealth. They also maintained a home in Milton. The Burrs had 169 Commonwealth house rebuilt, including replacing the front and rear façades. 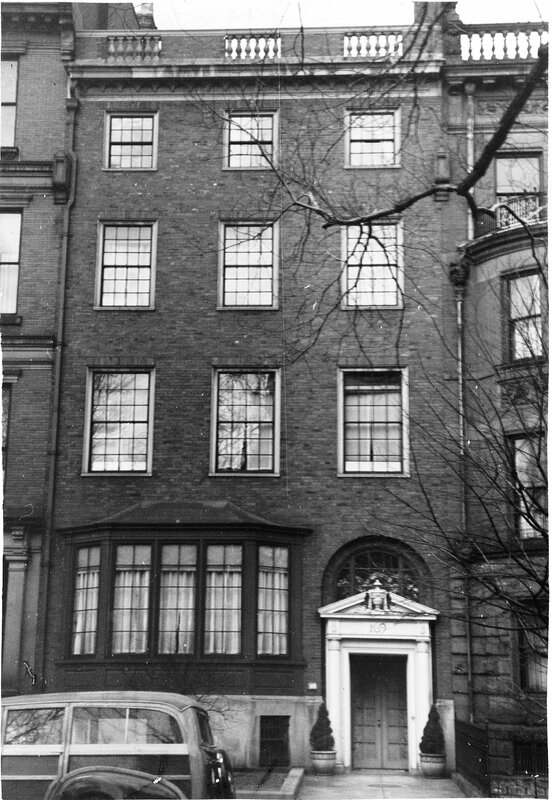 Parker, Thomas, and Rice, architects, designed the remodeled house; J. Harleston Parker had similarly rebuilt 173 Commonwealth in 1917 as his own home. I. Tucker Burr is shown as the owner on the building permit application for the remodeling of 169 Commonwealth, dated January 31, 1928. The Burrs continued to live at 169 Commonwealth until about 1942, when they moved back to the Hotel Agassiz. On September 1, 1942, 169 Commonwealth was purchased from the Burrs by Robert Winston Taylor of Baltimore. In October of 1942, he filed for permission to convert the property from a single-family dwelling into a lodging house. He subsequently abandoned the application, but refiled in August of 1943, and was granted permission to convert the house. By 1943, 169 Commonwealth had become the home of Robert Winston Taylor’s mother, Susan Jane (Northridge) Taylor Jones, the widow of Thomas Brierley Taylor and the former wife of David R. Jones. She operated 169 Commonwealth as a lodging house. Her older son, William Randolph Taylor, lived with her. He was a real estate and furniture dealer. They previously had lived at 59 Commonwealth, where she also had operated a lodging house. William Taylor married in 1943 to Ruth Ranghild Weckstrom. 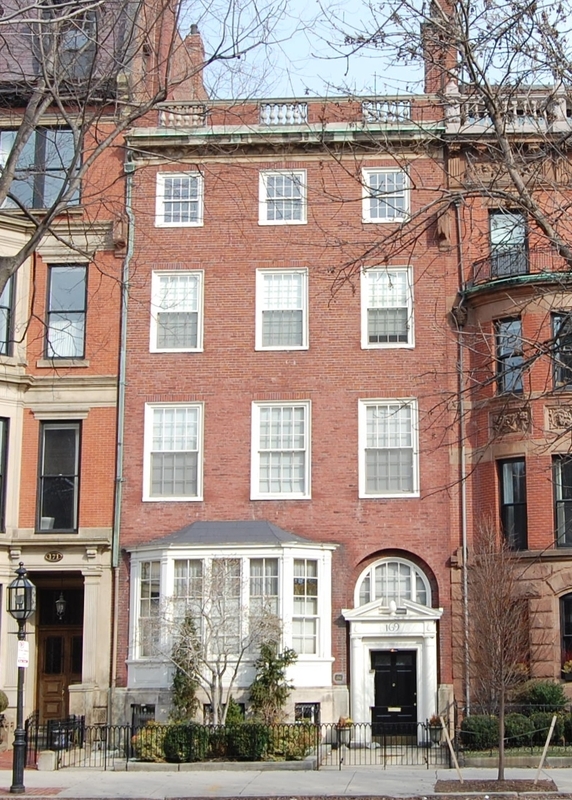 After he served in the US Navy during World War II, they lived at 122 Bowdoin. Robert Winston Taylor and his wife, Edna Beatrice (Walls) Taylor, moved from Baltimore in about 1945 and lived at 169 Commonwealth with his mother. On June 15, 1946, he transferred the property into his mother’s name. In about 1950, Robert and Edna Taylor moved to an apartment at 7 Hereford. By the early 1950s, Susan Taylor Jones had ceased using the name Jones and was known as Susan J. Taylor. She continued to live at 169 Commonwealth, and operate the lodging house, until about 1954. On January 8, 1954, 169 Commonwealth was acquired from Susan J. Taylor by Dr. William Joseph Macdonald and his wife, Elizabeth (Russell) Macdonald. In October of 1954, he filed for (and subsequently received) permission to convert the property from a lodging house into eight apartments. The Macdonalds lived in one of the apartments. They previously had lived in Newton. He was a physician and maintained his offices at 270 Commonwealth and later at 358 Commonwealth. He retired in the mid-1960s. William Macdonald died in December of 1970. On October 27, 1972, 169 Commonwealth was purchased from Elizabeth Macdonald by Neil St. John Raymond and Stuart W. Pratt. 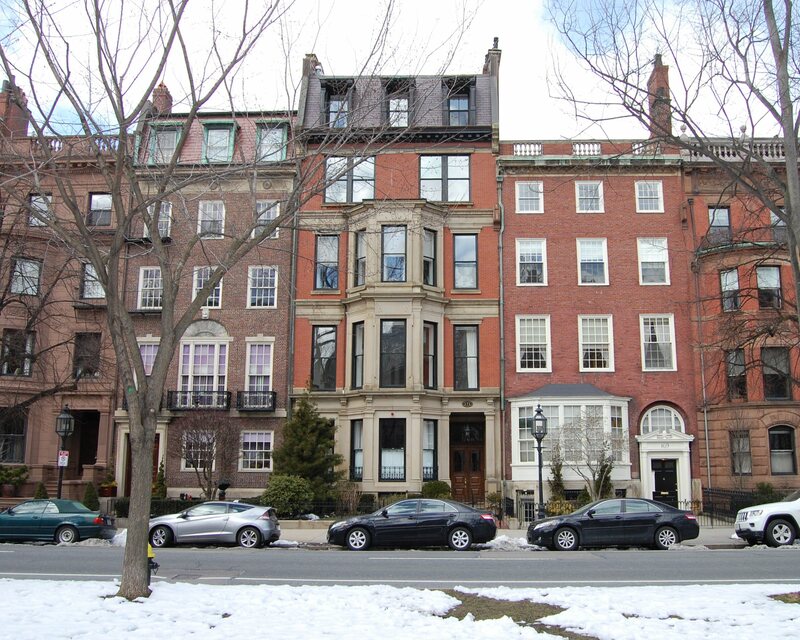 On September 18, 1973, they converted the property into five condominium units, the 169 Commonwealth Avenue Condominium. On September 21, 1979, the Condominium Master Deed was amended to increase the number of units from five to six, reflecting the subdivision of one of the units.